1. This one is apt to do on the back. It will make your sleeveless or halter tops look cool with the floral pattern. The pattern is simple and is suitable for women of any age group. Plus it is totally safe and pain free. 2. 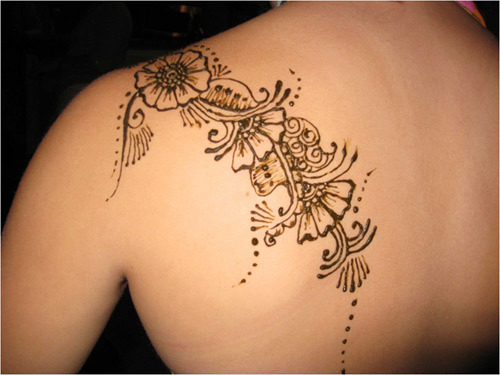 So would be brides – do you want some designs that would enhance your back for that .you would be wearing? Then we have a great option for you to try. This elegant design will look great on the bride with its floral and peacock designs. Also the added beads and bindis make it a great choice for anyone who wants to add a bit of sparkle to their back. Also if you want, you can do this design and keep the beads and stones aside. 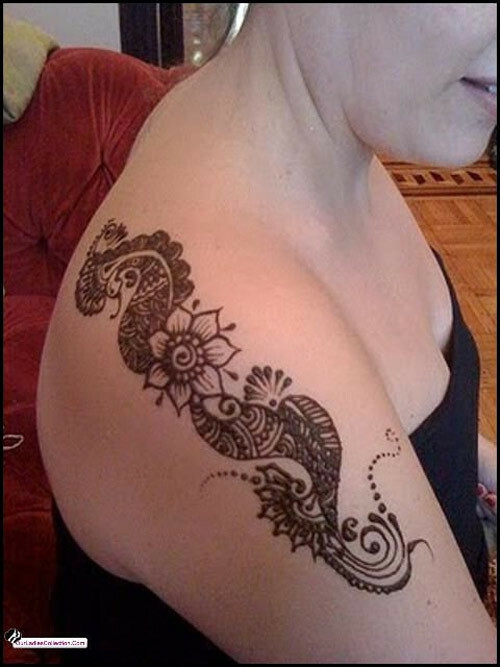 This design can also be extended to your hand mehandi and it would look very pretty on any bride. 3. We girls love Mermaids, don’t we? 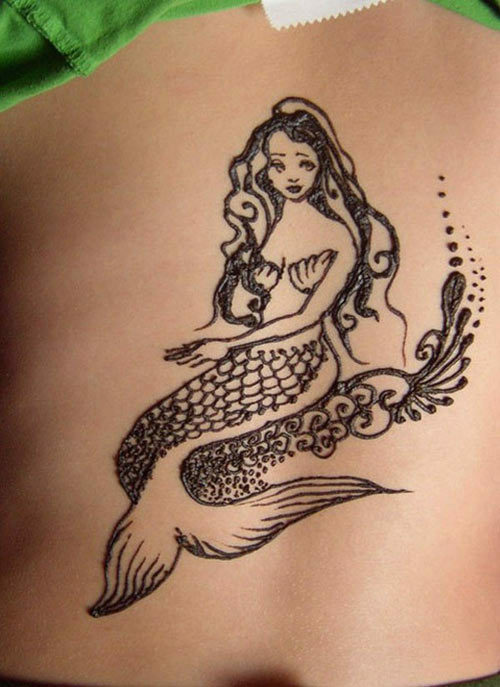 Then how about you try some Mermaids tattoo designs on your body too? You can do this design anywhere you please. It’s very feminine and will surely surprise anyone. 4. We love necklaces and when we can have them using Mehendi, then there’s nothing like it. 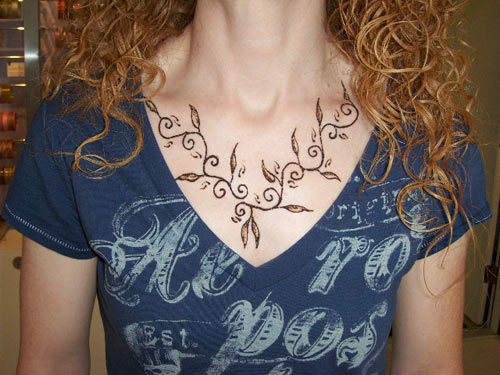 This one is for those who want to try something new and have their neck coloured with pretty necklace designs. Quite cute right? 5. Another one for the back. This one is not for the faint heated. 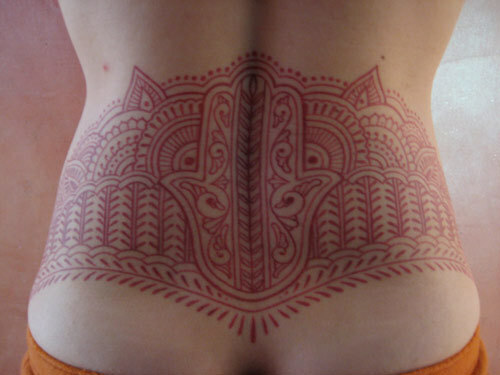 It is quite large and has a lot of intricately done designs and patterns. But one thing is for sure, this one will take any one’s breath away. 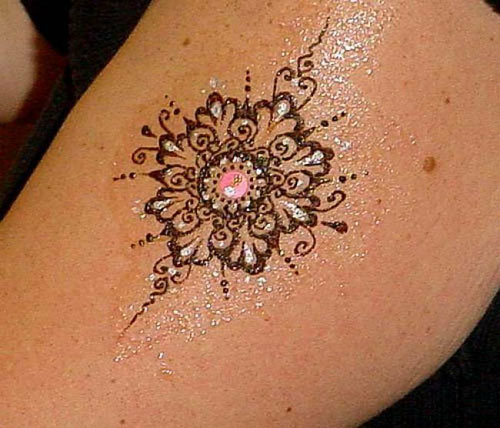 The tattoo is done with red mehndi which makes this design quite different from the black mehndi which is usually used to do tattoo’s. 6. Another design for the back, this one looks very feminine and can be carried off by anyone. The design comprises of mainly floral designs making this really apt for any one. This can also be done on the belly or lower back too. 7. 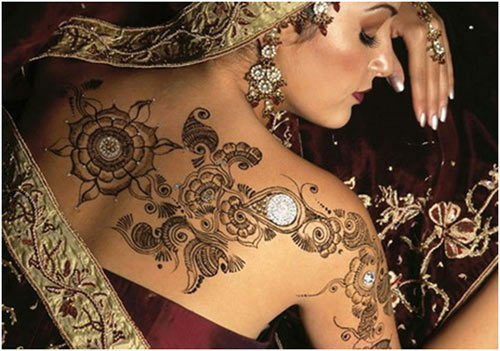 Not sure about doing mehandi tattoos on the back? Then try this design on the hands. This will add some colour to your hands all the while keeping it simple. There are a lot of small and intricately done patters. 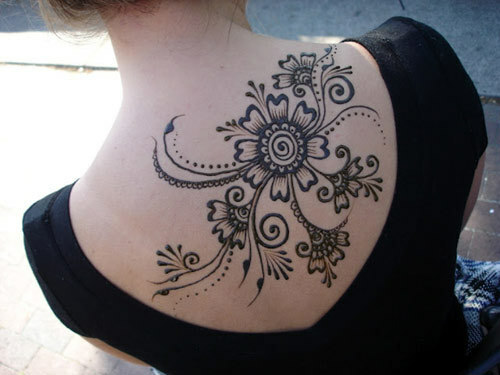 The main highlight though is the small floral motif in the middle of the design. If you are not comfortable with this one and want something simpler, then try the next design. 8. This one is really easy to carry and will look good on anyone. You can do it on your palm, on the back of the neck or anywhere you please. This one can also be decorated using small stones and glitters. Here the silver glitter from the tube and small golden and pink stones are used to decorate the center of the design.